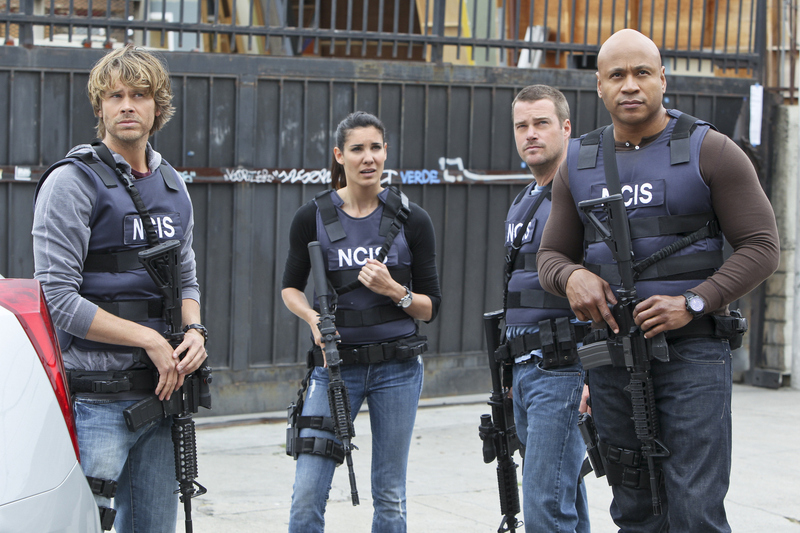 Pictured: Eric Christian Olsen (LAPD Liaison Marty Deeks) and Daniela Ruah (Special Agent Kensi Blye), Chris O'Donnell (Special Agent G. Callen) and LL COOL J (Special Agent Sam Hanna). Analyst Nell Jones joins the NCIS: LA team in the field when a former Navy officer’s girlfriend is kidnapped in exchange for Navy intelligence. Meanwhile, Deeks unknowingly breaks one of Hetty’s rules, on NCIS: LOS ANGELES, Tuesday, Oct. 22 (9:00-10:00 PM, ET/PT) on the CBS Television Network. Photo: Sonja Flemming/CBS ©2013 CBS Broadcasting, Inc. All Rights Reserved.